This Cheese Fondue Delft Blue Tapas Fondue from the Exclusive Dutch Collection is sure to add a touch-of-Dutch to your next fondue party. 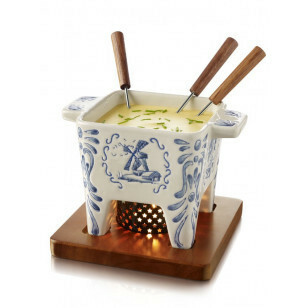 With a fresh design, the fondue pot has a hand-painted Delft blue motif that depicts Dutch scenes such as tulips, a windmill, Dutch cows, and of course, the Dutch maiden. Also included in the set are a mahogany wood board, 4 fondue forks, a metal ring decorated with tiny stars, and 1 tealight. This fondue is dishwasher and microwave safe, making clean up as well as preparation a cinch! Enjoy a unique experience and a truely Dutch fondue experience.